All Ready to Go Now! Eleven years ago, I made the best decision of my life. I left my job working for a regional park near my childhood home to head to an isolated corner of British Columbia. I had worked a few field jobs and was no stranger to a small town in the middle of nowhere, but nothing like Northern BC. With a 5 hour drive to the nearest hospital or hardware store or outdoor gear store, we were all on our own. I was seasonally employed and spend half my year traveling, so my budget wasn’t huge, but good gear was an absolute necessity. 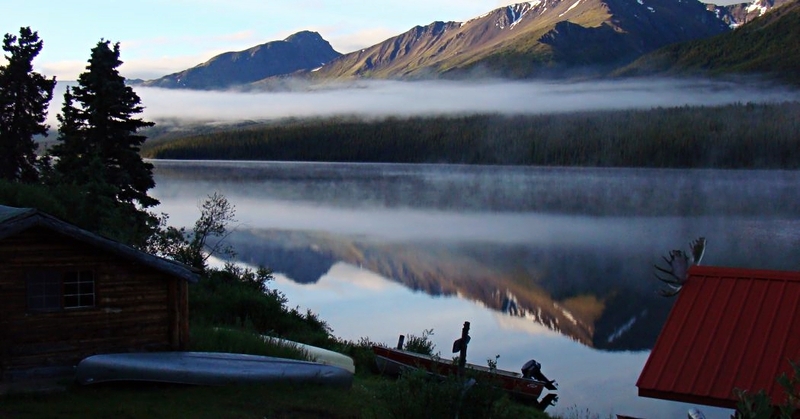 With no hospital, or even cell service for a good five hours drive, and worksites that were often accessed by multi days hikes or float plane, there was little room for error. I needed the gear that would keep me safe and warm, and since I was often packing chainsaws, gas, or other tools, my personal gear had to be light. I thought I’d share some of the gear that not only got me through those years up North but has also lasted the test of time. So lo and behold, my hiking gear list that stood the test of time and which helped me in the rough North. Meindls go against the current trend of going light on the feet. 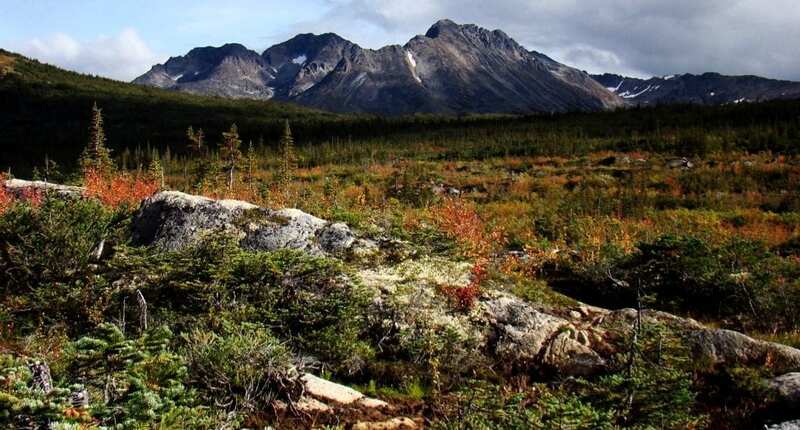 However, in the North, where trails are little more than game trails that disappear into swamps, they are a life-saver. I can’t say enough good things about these boots. At 3.5 lbs, they aren’t light, but they are bomb proof. My own pair will be celebrating their 10th birthday this year. In that time, I’ve gone through at least six pairs of lighter hiking shoes/boots. 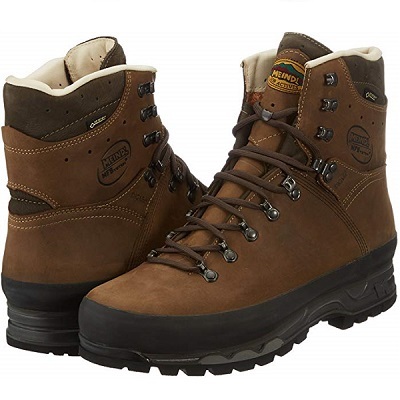 While I do opt for lighter boots when I’m going to be on easier terrain, my Meindls are a still my favorite for scrambles and rocky terrain. Their thick Vibram sole clings to slippery rocks and is solid enough to absorb pressure points from sharp rocks. The ankle support is fantastic, so I can be the clumsy creature that I am without rolling an ankle. I carried some heavy loads back then, and good boots kept me feeling supported enough to carry it all. The other big win for me is their waterproofing. Their high-quality leather and Gortex lining make them pretty darn amazing. On their first big trip, I had 10 days of route finding through some of the roughest (and swampiest) terrain I’ve hiked. It rained for the 5 five days straight, flooding trails, and soaking us to the bone – everywhere but my feet. I know a lot of the trail runner advocates who will insist just walking through the streams and letting the shoes dry is the way to go. But NO shoe is going to dry in the cold moist nights that you get up North, and multiple days of wet shoes and constant movement is a recipe for blisters and general foot unpleasantness. Hey, I like them so much I made a video review (where I said I was going to retire them, but later changed my mind). They are pricey, but they are the best gear investment I have made to date. I’ve never been a knife person. 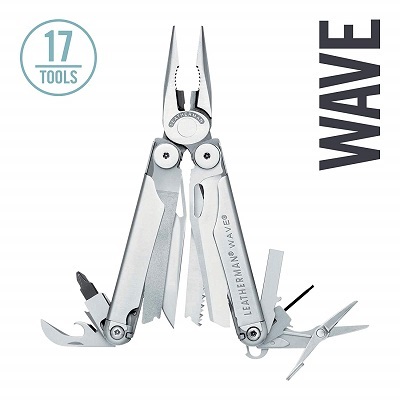 I was happy with my $15 Gerber and my little generic multi-tool when I moved North – until I was issued the Leatherman Wave for work. It’s like the Smartphone of knives. As soon as my first season ended and I had to give the thing pack, I bought my own. While you may be wondering why you need a screwdriver on a hiking trip, I can assure you that I’ve used each of the items while hiking, as well as at home puttering around the yard. The mini saw blade is adequate if you are sticking to the Leave No Trace principles and only using small branches for your fire. The scissors and pliers are handy for first aid purposes. Then, the wire cutters and screwdrivers are great for gear repair. If you are skilled in improvising, you can achieve a lot with the Leatherman Wave. Even if you don’t want something quite as heavy in your pack, it is useful for any anyone who likes saving the day because they have a Leatherman stashed in their purse (or pocket). Psst, it’s still up for grabs too! Ok, I have a confession to own. This isn’t what I own. My own sil-poncho is no longer on the market and, for the same weight, the Sea to Summit one is considerably larger. 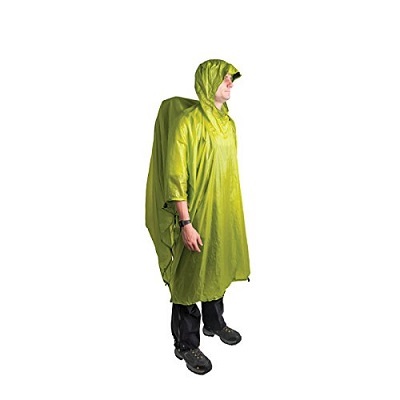 The NanoTarp-Poncho is a great addition to your hiking kit. It’s just 8.1 oz and will give you 57” by 104” of fully waterproof tarp. The hole and hood are in the center and can snap along the side to turn it to a poncho that will go past your knees and cover your pack. As a tarp, it’s big enough for building an emergency sleep shelter or a shelter for shade or cooking in camp. 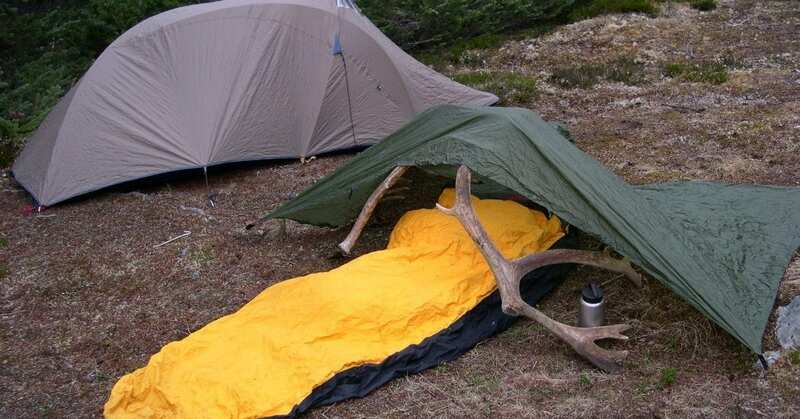 People do use it as their primary shelter, but it wouldn’t be the greatest for bad weather camping. It’s also handy for covering packs and gear, or as a groundsheet for your tent or tarp shelter. I always keep mine in my day pack for emergencies and almost always find a use for it on backpacking trips. A little extra protection for this bivy setup using my old, smaller sil poncho tarp. There has to be some irony in the fact that while hammock camping has been slow to catch on in Canada, the Canadian-based Hennessy was one of the camping hammock innovators. In fact, it was an American who turned me on to Hennessy. 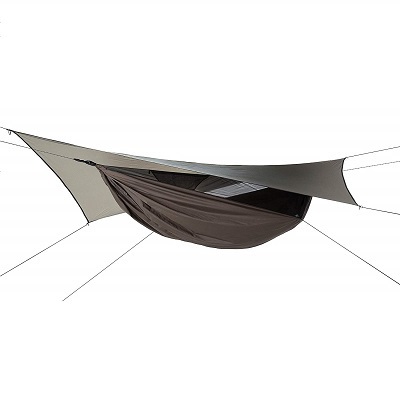 Hennessy’s camping hammocks come with an attached mosquito net and have a tarp that’s made perfectly to size. My favorite design feature is the asymmetric design that keeps your body fairly flat for a more comfortable sleep. So far, it’s taken me through every storm without getting wet. 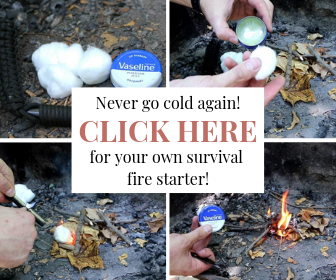 I use it with a sleeping pad tuck inside but you can also buy an underquilt or a reflective pad from Hennessy (or make them yourself) to keep you warm. Containers that collect rainwater from the tarp. Extra mesh pockets – the hammock has one that fits a water bottle and headlamp perfectly. You can also set up [this hammock] with sticks or your hiking poles as a tarp shelter on the ground. At 2 lb 6 oz, the Ultralite Backpacker Classic is lighter than any tent you could get in its price range. It’s a fantastic option for a solo hiker or for someone who doesn’t like sharing a tent. I can’t give my Meindl Islands all the credit for keeping my feet dry. My Outdoor Research Verglas Gaiters played a big role too. When I’m slogging through mud and shallow streams and sopping wet bushes, they stop water from coming into the boots from the tops. The same can be said for walking through snow and dirt as well. They protect your legs from branches and rocks, shielding your legs and clothing underneath. Incidentally, they also help keep your legs and pants cleaner. I have a bit of a gimpy gait, and without gaiters, I end up with muddy streaks, and occasionally abrasions or tears on my legs from my feet brushing against the insides of my legs. They also make it hard for ticks to get inside my pant legs. 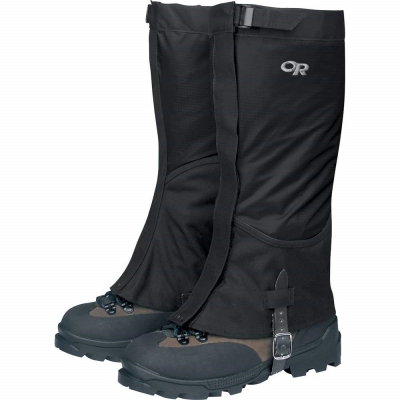 The nylon 70D ripstop uppers ensure dry legs. At the same time, the heavier Cordura® inner portion and boot portion means extra durability against sticks, rocks, and feet brushing by. They also don’t droop like some of the lighter weight gaiters do. Check the Latest Price (Women)! Check the Latest Price (Men)! 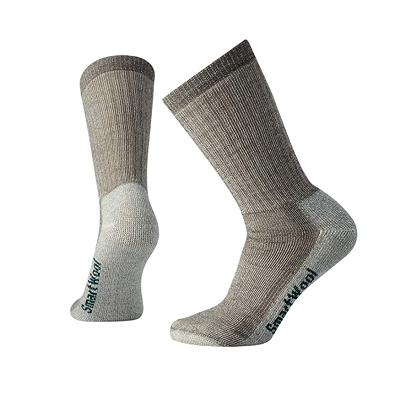 Purchased as a broke college student in 2004, these Smartwool socks were my first pair of hiking sock. I still own that pair! Albeit they are a bit drooping and have now become my sleeping socks. Still, they are tough and have endured many miles. Over the next few years, I added a few more to my collection, and those ones are still in rotation. They are also my comfiest wool socks and have kept my feet warm and blister-free in some really wet and cold hikes. I still usually wear them with a sock liner, but they are fine without too. It’s no wonder they are still going strong in the hiking sock market. When I reach for some wool socks for three season hiking, these are the ones I go for. Another pair of socks? you ask. I realize that there are a lot of items on this list that involve feet, but feet are darn important! Sometimes, it’s too hot for wool socks, even up North. WrightSocks don’t quite have the durability of my Smartwool socks, but they are still worth it, especially if you don’t go on hikes that involve days of slogging through mud. 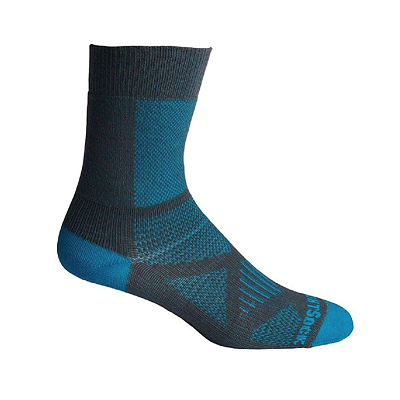 These socks are made of a blend of breathable, sweat-wicking synthetic fabrics. Their real winning feature, though, is their double layer construction. It essentially has a built-in sock liner. The two layers rub against each other instead of your skin, giving you a blister-free hike. Wrightsock even provides a blister-free guarantee! These snowshoes are built for some pretty tough terrain. 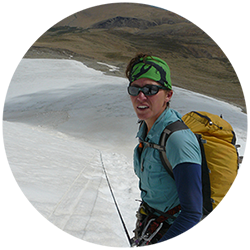 Its aggressive crampons can attack some seriously steep, icy slopes while the aluminum frame with additional traction keeps the snowshoes light (the women’s version weighs only 3.75 lb). The straps may be finicky, but once they are on, I don’t need to stop to fiddle with them until the end of the day. In addition to an aggressive and lightweight design, MSR really worked here for a snowshoe that is comfortable and ergonomic for all wearers. For starters, the women’s model allows for a narrower gait. For those who over or under pronate, the foot portion can be rotated in or out so it doesn’t throw your gait off or cause you to trip over yourself. They also have a heal bar that you can flip up to reduce fatigue on steep slopes. 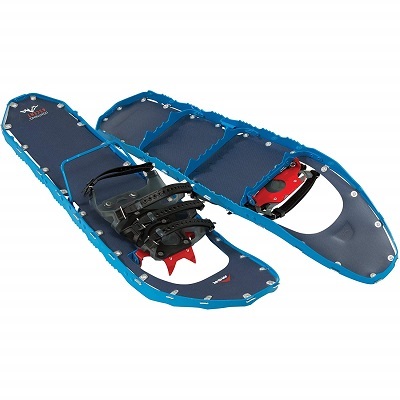 If you want to tackle some mountains and steep terrain in snowshoes, these are the way to go. This was Carley’s hiking gear list of essentials that helped her during her days in the remote Northern British Columbia (and as you’ve seen, well after it as well) but we’re curious: what’s that gear that never misses from your pack? what’s on YOUR essential hiking gear list?